1 What is Domain Name Registration? 2 What is DNS and Name Server ? 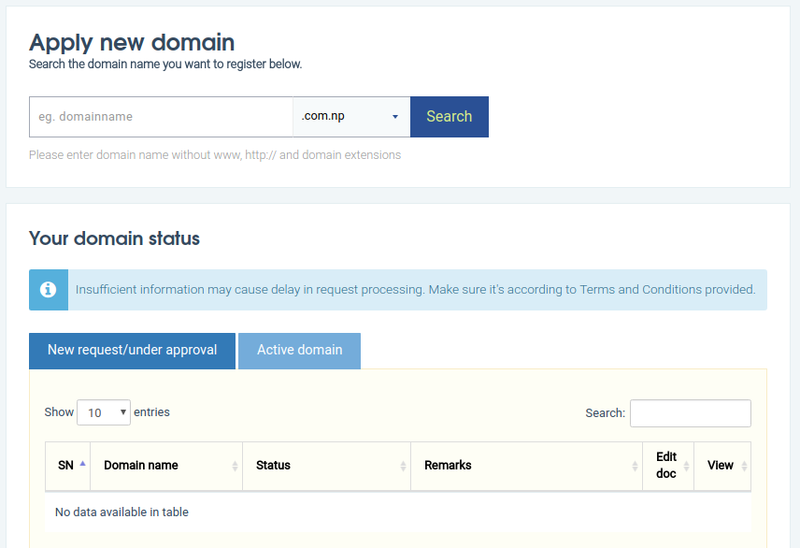 .np domain is country code Top Level Domain (ccTLD) for Nepal. Mercantile Communications Pvt. Ltd. handled the .np domain registration in Nepal. Mercantile Communications Pvt. Ltd. was established on 1994 AD. A domain name is the address where Internet users can access your website using it. Domain Name are unique in internet which determine it’s resource. The Internet is based on IP addresses, not domain names, every Web server requires a Domain Name System (DNS) server to translate domain names into IP addresses. Here We will be guiding you through the .np domain registration. We recommend you to go through all these explanation. You will not need search for domain registration next time. If you are in hurry click Basic .np Domain registration Process and start Domain registration. A Domain Name is a String which represent a unique identification for your resources online. Mainly Domain name are used to access website. Web servers use HTTP protocol over TCP/IP to serve a website. So every Domain Name Registration is a way of adding records in the DNS (Domain Name System). Domain registration is the process of acquiring a domain name from a domain name registrar. Domain Name are never owned, we just take them of some period of time. Registration of a domain name establishes a set of Start of Authority (SOA) records in the DNS servers of the parent domain, indicating the IP address (or domain name) of DNS servers that are authoritative for the domain. This provides merely a reference for how to find the domain data – not the actual domain data. The SOA record has DNS nameservers information. What is DNS and Name Server ? The DNS(Domain Name System) is a database that works like a phone book for computers: it converts a domain name, such as “timeandupdate.com,” to a machine-readable IP address, such as “192.48.79.30.” The DNS is maintained by several organizations, including IANA (Internet Assigned Numbers Authority) and ICANN (Internet Corporation for Assigned Names and Numbers). Nameservers are part of DNS, nameservers provide the IP address of the domain to your browser. So for Domain Registration you need to provide Name Server of your Hosting Providers. So the request goes to your hosting service and it will determine which contents to send to the users. .np is a Country Code Top Level Domain (ccTLD). Mercantile Communications Pvt. Ltd. is domain registry for .np domain. They have been providing the .np domain name registration for more then 20 years. np domain registration is similar as Domain registration. Here Domain Registration for .np domain is free of cost and it is based on first-come-first-serve and for life time. (Yet there is no Expire date for np domain). Domain Name Server modification takes lots of time. Requested domain name must be of at least 3 characters. Alphanumeric and dash (hyphen) are accepted. The first and last characters may not be a dash (hyphen). Domain Names containing offensive or generic or inflammatory words will not be registered. For .np domain registration scanned copies of original documents for the verification process. Scanned certificate of registration of company/firm/partnership/organization. and a Cover letter is Required for np domain registration. Nepalese citizenship or passport or driving license or voter’s card and Cover Letter is required for registering .np domain for personal use. A personal domain name should be based only on applicant’s name as mentioned in above documents. 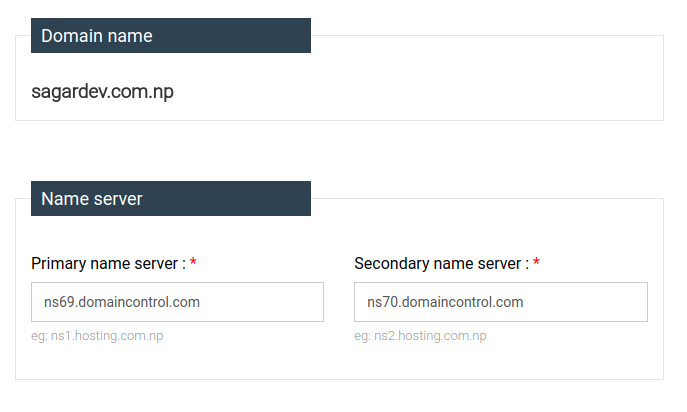 Which nameserver to use for .np domain registration in nepal ? Where/How do I host .np domain ? As I already mention, They take lots of time for domain registration and modifications. 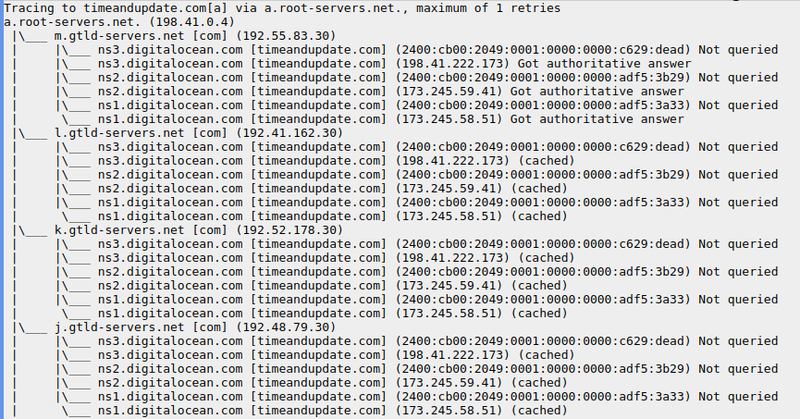 If you need to change hosting services, it would be really painful as domain would not resolve again. Site will go down. So If we could use some DNS Providers, we would never need to update our name server from np domain register. We can do any DNS configuration from DNS Server. Here we will be using Godaddy DNS hosting. After you .np domain is accepted and registered. 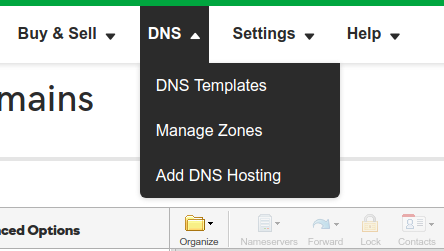 You can update DNS records on DNS Server and server your website. As here in this is for .np domain registration in Nepal. Domain Hosting Need a separate article. We just found a video about domain registration for the Updated process (the new process as described in this page), All the process in this video are the same as described in this page so you can follow this video tutorials too. First you need to create your account on register.com.np. Follow this link to create your account https://register.com.np/register. Enter your Name, email and Password to Create your account. You need to verify your account and email address. Now Login to your account from User Login Section. Now You will be on the Np Domain Dashboard. Here are all the information about your domain. You can apply for new domain from the section Apply new domain and your Registered and in Process domains are on Your domain status section. You can click and select New request/under approval and Active domains. Now Enter the domain name you want to register and Select the Extensions that fits your domain. If you are registering for Personal domain .com.np, .info.np, .name.np, .pro.np are the most popular and allowed domain for personal website. To register your domain the domain should not been registered already. So First Domain register will check the domain availability. Click in search to check domain availability. If you get Error message Sorry! Domain is already taken. Please choose a bit different domain name again remember to follow the domain name rules. If you Domain name is available Congratulations ! your domain is available. Click “Register now” for further process. Now Click in Register now to Process. Now you need to provide the Nameservers and your information. Fill your informations. For Post box code Check Postal Code for Nepal. We will be using Godaddy DNS Server. Follow the article and Create your account on Godaddy. Then login to https://dcc.godaddy.com/dcc50/. And Select the DNS dropdown and select Add DNS Hosting. Now Enter your domain name that is available for registration and click in on Next. Now you will get Two Name Servers. Now Enter the Generated Nameservers in .np Domain registrations process. Now Process and Fill all the Required Information about you then click in Save and continue. In the next page you need to provide Copy of citizenship for Personal website or Copy of company registration for Organization domain registration and Cover Letter. Now In the Attach required documents Select Registration/Citizenship card from DropDown. Then click in Choose File, Then Select your scanned copy Registration (Official) or Citizenship (Personal). and Click in Save Image. You can Capture the Image of your Citizenship card. Open Paint to merge the image. Front at top and back at bottom. Save and Upload. Remember it should be less than 800 KB. Now you Need to provide Cover letter for the domain registration. Cover letter are necessary as per new update for domain registration. Find your Cover Letter for np Domain Registration Request. In the Domain Registration in Attach Required Document. Select Cover letter as document Title and Upload the cover letter and Click in save Image. When you enter Registration/Citizenship card and Cover Letter you can Process further. Click in Request Domain to request domain registration. That’s all you new domain will be shown on the New request/under approval in .np domain registration Dashboard. You Register your Domain Name and the status will be updated within the next working day. A Domain Name is a String which represent a unique identification for your resources online. Nameservers are part of DNS. The DNS(Domain Name System) is a database that works like a phone book for computers: it converts a human readable domain name into machine-readable IP address. Domain hosting is the processing of storing your domain contents on a Server PC, which is online 27/7. np domain registration in nepal are done with Mercantile Communications Pvt. Ltd. Scan copy of Registration/Citizenship card are required. You Register your Domain Name and will be approved within the next day. Is there any way to get the domains those are already registered and had never been used?? ?